Let our bar be the life of your party! From wine, beer and cider to full liquor bar with unique seasonal cocktails. Our bar packages include a full range of spirits, mixers, wines, beers, ciders, non-alcoholic beverages, & house-made bar snacks. We can accommodate any budget, from our affordable “Dive Bar” package, featuring 16oz Tall Boy cans to our premium “Drink Local” package, featuring only locally-sourced spirits and mixers. 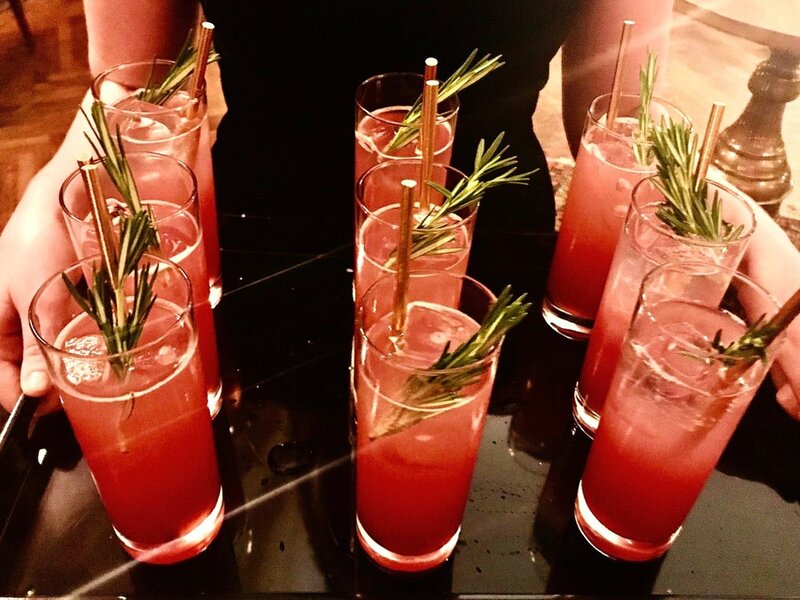 Our cocktail offerings vary with the seasons, from Jalapeño Hibiscus Gimlets to Blackberry Mint Juleps to Watermelon Shiso Shooters.. And we love to create custom cocktails just for your occasion. Our chefs make the best snacks to accompany our bars. Bacon Caramel Popcorn, Smoky Sriracha Corn Nuts, and Dark Chocolate Brownie Bites just to name a few! At Campbell & Co, we’re known for our friendly service. We pride ourselves on our gracious and attentive staff. Our Head Bartender has nearly two decades of experience mixing in drinks in the best NYC bars. And all our bartenders are experienced mixologists with TIPS certification. Let your guests build their own cocktails with our interactive Bar Stations. A few of our favorites include Bloody Mary & Micheleda Bar with Housemade Pickles, Mimosa Bar with Fresh Nectars & Berries, Whiskey Manhattan Bar with Artisan Bitters, & Mocktail Bar with Fresh-Squeezed Juices. Campbell & Co is a full-service catering company. We can provide everything from cocktail-hour grazing tables & passed appetizers to interactive stations & family-style dinners So if you also need to feed your guests, please visit our Events Catering page. Thanks for considering us. We look forward to starting the conversation. with any budget or timeframe. You can get in touch many ways! Fill out the form to the right and we'll reach out. Feel free to share any details you have, such as a date, venue, guest count, event time and length, or anything else. Which of our services are you most interested in learning more about?